All mobile users are actually to re-confirm their SIMs via the biometric verification method, as per the tips provided with the aid of PTA. It is mandatory for each unmarried mobile consumer of Pakistan that his/her prepaid or postpaid SIM of any cellular operator of Pakistan need to be tested via biometric verification device through thumb affect. In case you want to test that whether or not your pay as you go or postpaid SIM is biometrically validated or now not. We completely upgrade our readers with the information that how to test in case your SIM is demonstrated via biometric verification system or not. 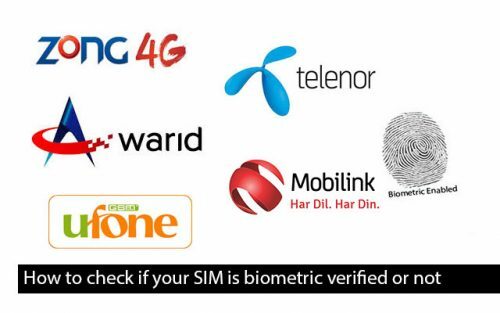 So, study the bellow process to have a look at the easy method for checking either SIM is biometrically certified or not on Warid / Glow, Zong, Ufone, Telenor Talkshawk / djuice and Mobilink Jazz. It’s far worth mentioning right here that the procedure to test SIM verification via BVS is honestly free of charges. Simply dial *6622# from your Zong prepaid or postpaid SIM. The verification status of your Zong SIM will be received via SMS. Visit Zong Service Centre, franchise or retailer in case of un-verified Zong SIM. Simply dial *336*1# from your Ufone prepaid or postpaid SIM. The verification status of your Ufone SIM will be received via SMS. Visit Ufone Service Centre, franchise or retailer in case of un-verified Ufone SIM. Simply send your CNIC (without Dashes) to 6001 from your Mobilink prepaid or postpaid SIM. The verification status of your Mobilink SIM will be received via SMS. Visit Mobilink Service Centre, franchise or retailer in case of un-verified Mobilink SIM. Simply send your CNIC (without dashes) to 789 from your Warid or Glow prepaid or postpaid SIM. The verification status of your Warid SIM will be received via SMS.